The Barrett 910 is an automatic tuning mobile antenna designed to interface with Barrett 500, 900 and 2000 series transceivers. Providing a frequency coverage of 2 to 30MHz, the Barrett 910 features rapid tuning (typically <1.5S) and low power consumption. High radiation efficiency and accurate tuning are assured by maximising antenna current (not minimising the VSWR) on every tune. 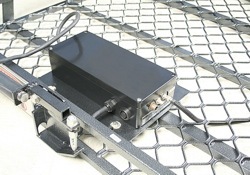 The Barrett 910 antenna incorporates a wideband amplifier that is activated in receive mode to enable channel scanning. Due to its rugged RF design the Barrett 910 antenna can also be used with high duty cycle applications such as the Barrett 923 or 2020 fax and data system. 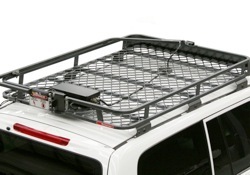 The active tuning elements of the antenna are housed in a grey weatherproof, impact resistant reinforced poly-carbonate moulding that incorporates a heavy duty anti-vibration mount at its base, even with its rugged construction, the Barrett 910 weighs only 2.8 kg. 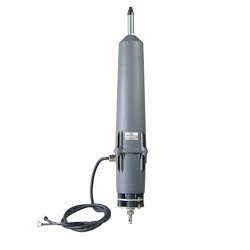 The Barrett 910 is supplied with an integral 2 metre whip and spring. 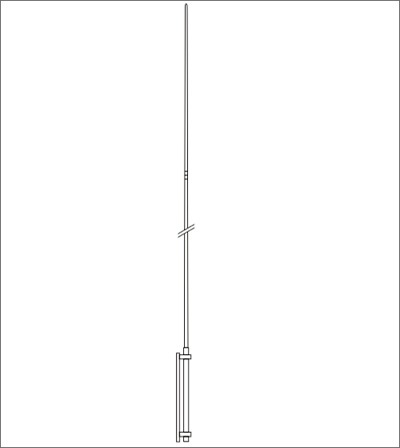 The main antenna body has a 1.5 metre stub control cable, with a 4.5 metre extension cable to connect it with the transceiver. This composite cable incorporates coaxial, power supply and control cables. Additional 6 metre or 10 metre extension cables are available if required. 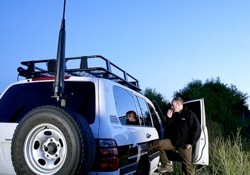 The Barrett 2019 is a solid state automatic tuning mobile HF antenna, designed for use with Barrett 2000 series transceivers. The 2019 provides frequency coverage of 2 to 30 MHz with a rapid tuning time of typically less that 1.5 S.
High radiation efficiency and accurate tuning are assured by maximising the antenna current on every tune. This is unlike most manufacturers that minimise the VSWR. The Barrett 2019 antenna activates a wideband amplifier in receive mode to enable channel scanning. Due to its rugged RF design, the Barrett 2019 antenna can also be used with high duty cycle applications such as the Barrett 2020 email, fax and data system and is fully compatible with ALE operation. An optional GPS receiver can be fitted within the 2019 antenna casing and interfaces directly through the RF control cable to current production 2050 transceivers. 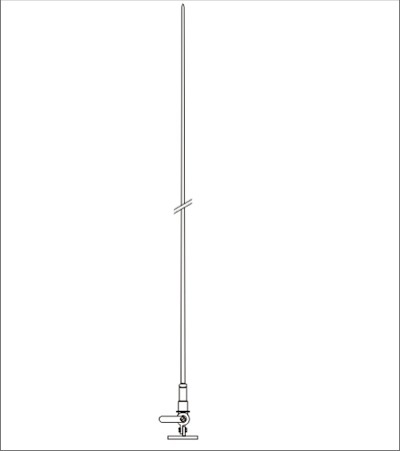 The 917 series unloaded marine whip antennas are designed to operate in all marine bands from 2 to 30 MHz. a range of sizes and mounting configurations to suit differing types and sizes of vessels. 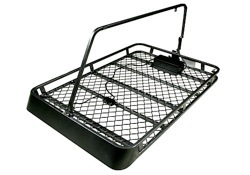 Is a 3.6 metre whip suitable for smaller vessels, particularly high speed craft. It is supplied complete with a stainless steel swing-down base fitting. Is a 5.5 metre whip suitable for vessels over 10 metres in length. The whip is supplied in two sections which screw together on a self locking taper. Also included are side-mount insulators for mounting against a vertical structure. Is an 7.0 metre whip suitable for large vessels, the whip is supplied in two sections and is supplied complete with side-mount insulators for mounting against a vertical structure. 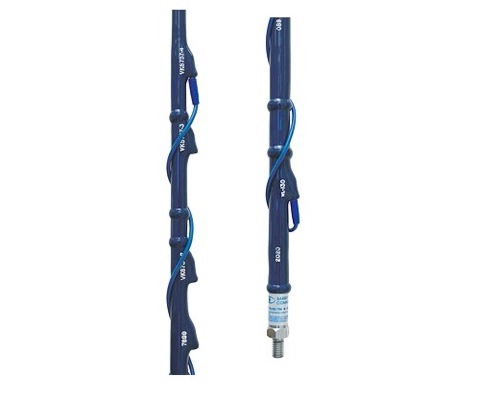 Is a 10 metre, GMDSS standard, base mounted whip suitable for large vessels. It is designed for professional use and can withstand wind speeds of up to 200 km/h without permanent deformation. Frequency selection is achieved by the re-location of a tapping plug to a specific socket for each frequency. 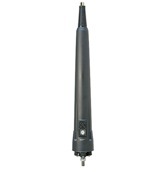 Barrett 914 antennas have a maximum of 12 individual frequencies in the range 2 to 30MHz. The complete assembly consists of a helically wound whip section, encapsulated in a tough polyurethane resin and a separate heavy duty mounting base and spring. Connection to the transceiver is via an integral UHF coaxial connector in the mounting base. The Barrett 914 antenna is an extremely robust, high efficiency antenna, with no moving parts and is designed for use in the harshest environments. 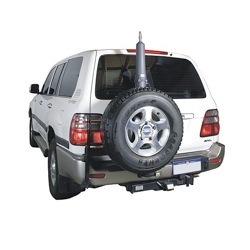 The Barrett 2018 mobile magnetic loop HF antenna is significantly more efficient than any whip-type vehicle antenna; producing considerably more transmit and receive power. 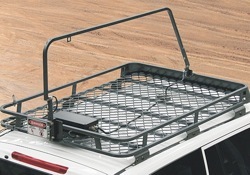 The 2018 has been integrated in a custom made roof rack. The ground plane for the antenna is a heavy-duty aluminium mesh floor, which is welded to the frame bars, maximising current within the radiating loop. the world's worst remote area conditions and is designed to withstand rough corrugated, pot holed and unsealed roads.